Luella Miller first appeared in 1903 in the collection The Wind in the Rose-bush and Other Stories of the Supernatural . Featured in Halloween Stories, and representative of Feminist and Gothic Literature. "Weak heart; weak fiddlesticks! There ain't nothin' weak about that woman. She's got strength enough to hang onto other folks till she kills 'em." Close to the village street stood the one-story house in which Luella Miller, who had an evil name in the village, had dwelt. She had been dead for years, yet there were those in the village who, in spite of the clearer light which comes on a vantage-point from a long-past danger, half believed in the tale which they had heard from their childhood. In their hearts, although they scarcely would have owned it, was a survival of the wild horror and frenzied fear of their ancestors who had dwelt in the same age with Luella Miller. Young people even would stare with a shudder at the old house as they passed, and children never played around it as was their wont around an untenanted building. Not a window in the old Miller house was broken: the panes reflected the morning sunlight in patches of emerald and blue, and the latch of the sagging front door was never lifted, although no bolt secured it. Since Luella Miller had been carried out of it, the house had had no tenant except one friendless old soul who had no choice between that and the far-off shelter of the open sky. This old woman, who had survived her kindred and friends, lived in the house one week, then one morning no smoke came out of the chimney, and a body of neighbours, a score strong, entered and found her dead in her bed. There were dark whispers as to the cause of her death, and there were those who testified to an expression of fear so exalted that it showed forth the state of the departing soul upon the dead face. The old woman had been hale and hearty when she entered the house, and in seven days she was dead; it seemed that she had fallen a victim to some uncanny power. The minister talked in the pulpit with covert severity against the sin of superstition; still the belief prevailed. Not a soul in the village but would have chosen the almshouse rather than that dwelling. No vagrant, if he heard the tale, would seek shelter beneath that old roof, unhallowed by nearly half a century of superstitious fear. There was only one person in the village who had actually known Luella Miller. That person was a woman well over eighty, but a marvel of vitality and unextinct youth. Straight as an arrow, with the spring of one recently let loose from the bow of life, she moved about the streets, and she always went to church, rain or shine. She had never married, and had lived alone for years in a house across the road from Luella Miller's. This woman had none of the garrulousness of age, but never in all her life had she ever held her tongue for any will save her own, and she never spared the truth when she essayed to present it. She it was who bore testimony to the life, evil, though possibly wittingly or designedly so, of Luella Miller, and to her personal appearance. When this old woman spoke—and she had the gift of description, although her thoughts were clothed in the rude vernacular of her native village—one could seem to see Luella Miller as she had really looked. According to this woman, Lydia Anderson by name, Luella Miller had been a beauty of a type rather unusual in New England. She had been a slight, pliant sort of creature, as ready with a strong yielding to fate and as unbreakable as a willow. She had glimmering lengths of straight, fair hair, which she wore softly looped round a long, lovely face. She had blue eyes full of soft pleading, little slender, clinging hands, and a wonderful grace of motion and attitude. "Luella Miller used to sit in a way nobody else could if they sat up and studied a week of Sundays," said Lydia Anderson, "and it was a sight to see her walk. If one of them willows over there on the edge of the brook could start up and get its roots free of the ground, and move off, it would go just the way Luella Miller used to. She had a green shot silk she used to wear, too, and a hat with green ribbon streamers, and a lace veil blowing across her face and out sideways, and a green ribbon flyin' from her waist. That was what she came out bride in when she married Erastus Miller. Her name before she was married was Hill. There was always a sight of "l's" in her name, married or single. Erastus Miller was good lookin', too, better lookin' than Luella. Sometimes I used to think that Luella wa'n't so handsome after all. Erastus just about worshiped her. I used to know him pretty well. He lived next door to me, and we went to school together. Folks used to say he was waitin' on me, but he wa'n't. I never thought he was except once or twice when he said things that some girls might have suspected meant somethin'. That was before Luella came here to teach the district school. It was funny how she came to get it, for folks said she hadn't any education, and that one of the big girls, Lottie Henderson, used to do all the teachin' for her, while she sat back and did embroidery work on a cambric pocket-handkerchief. Lottie Henderson was a real smart girl, a splendid scholar, and she just set her eyes by Luella, as all the girls did. Lottie would have made a real smart woman, but she died when Luella had been here about a year—just faded away and died: nobody knew what ailed her. She dragged herself to that schoolhouse and helped Luella teach till the very last minute. The committee all knew how Luella didn't do much of the work herself, but they winked at it. It wa'n't long after Lottie died that Erastus married her. I always thought he hurried it up because she wa'n't fit to teach. One of the big boys used to help her after Lottie died, but he hadn't much government, and the school didn't do very well, and Luella might have had to give it up, for the committee couldn't have shut their eyes to things much longer. The boy that helped her was a real honest, innocent sort of fellow, and he was a good scholar, too. Folks said he overstudied, and that was the reason he was took crazy the year after Luella married, but I don't know. And I don't know what made Erastus Miller go into consumption of the blood the year after he was married: consumption wa'n't in his family. He just grew weaker and weaker, and went almost bent double when he tried to wait on Luella, and he spoke feeble, like an old man. He worked terrible hard till the last trying to save up a little to leave Luella. I've seen him out in the worst storms on a wood-sled—he used to cut and sell wood—and he was hunched up on top lookin' more dead than alive. Once I couldn't stand it: I went over and helped him pitch some wood on the cart—I was always strong in my arms. I wouldn't stop for all he told me to, and I guess he was glad enough for the help. That was only a week before he died. He fell on the kitchen floor while he was gettin' breakfast. He always got the breakfast and let Luella lay abed. He did all the sweepin' and the washin' and the ironin' and most of the cookin'. He couldn't bear to have Luella lift her finger, and she let him do for her. She lived like a queen for all the work she did. She didn't even do her sewin'. She said it made her shoulder ache to sew, and poor Erastus's sister Lily used to do all her sewin'. She wa'n't able to, either; she was never strong in her back, but she did it beautifully. She had to, to suit Luella, she was so dreadful particular. I never saw anythin' like the fagottin' and hemstitchin' that Lily Miller did for Luella. She made all Luella's weddin' outfit, and that green silk dress, after Maria Babbit cut it. Maria she cut it for nothin', and she did a lot more cuttin' and fittin' for nothin' for Luella, too. Lily Miller went to live with Luella after Erastus died. She gave up her home, though she was real attached to it and wa'n't a mite afraid to stay alone. She rented it and she went to live with Luella right away after the funeral." Then this old woman, Lydia Anderson, who remembered Luella Miller, would go on to relate the story of Lily Miller. It seemed that on the removal of Lily Miller to the house of her dead brother, to live with his widow, the village people first began to talk. This Lily Miller had been hardly past her first youth, and a most robust and blooming woman, rosy-cheeked, with curls of strong, black hair overshadowing round, candid temples and bright dark eyes. It was not six months after she had taken up her residence with her sister-in-law that her rosy colour faded and her pretty curves became wan hollows. White shadows began to show in the black rings of her hair, and the light died out of her eyes, her features sharpened, and there were pathetic lines at her mouth, which yet wore always an expression of utter sweetness and even happiness. She was devoted to her sister; there was no doubt that she loved her with her whole heart, and was perfectly content in her service. It was her sole anxiety lest she should die and leave her alone. "'Do leave her with me, Mrs. Mixter, and you get back to bed,' says I, for Aunt Abby had been layin' down considerable lately, though somehow she contrived to do the work. "'What is—what is it, oh, what is it?' she sort of screeches out. Then she goes off a-laughin' enough to kill. "'Poor lamb, poor little lamb,' says Aunt Abby, standin' over her, all kind of tottery, and tryin' to bathe her head with camphor. "'I guess she won't get up,' says I, 'sick as she is.' I was gettin' madder and madder. There was somethin' about that little pink-and-white thing standin' there and talkin' about coffee, when she had killed so many better folks than she was, and had jest killed another, that made me feel 'most as if I wished somebody would up and kill her before she had a chance to do any more harm. "'Is Aunt Abby sick?' says Luella, as if she was sort of aggrieved and injured. "'Yes,' says I, 'she's sick, and she's goin' to die, and then you'll be left alone, and you'll have to do for yourself and wait on yourself, or do without things.' I don't know but I was sort of hard, but it was the truth, and if I was any harder than Luella Miller had been I'll give up. I ain't never been sorry that I said it. Well, Luella, she up and had hysterics again at that, and I jest let her have 'em. All I did was to bundle her into the room on the other side of the entry where Aunt Abby couldn't hear her, if she wa'n't past it—I don't know but she was—and set her down hard in a chair and told her not to come back into the other room, and she minded. She had her hysterics in there till she got tired. When she found out that nobody was comin' to coddle her and do for her she stopped. At least I suppose she did. I had all I could do with poor Aunt Abby tryin' to keep the breath of life in her. The doctor had told me that she was dreadful low, and give me some very strong medicine to give to her in drops real often, and told me real particular about the nourishment. Well, I did as he told me real faithful till she wa'n't able to swaller any longer. Then I had her daughter sent for. I had begun to realize that she wouldn't last any time at all. I hadn't realized it before, though I spoke to Luella the way I did. The doctor he came, and Mrs. Sam Abbot, but when she got there it was too late; her mother was dead. Aunt Abby's daughter just give one look at her mother layin' there, then she turned sort of sharp and sudden and looked at me. "'Where is she?' says she, and I knew she meant Luella. "'You are another, young man; she's got her pretty claw on you,' thinks I, but I didn't say anythin' to him. I just said over to Mrs. Sam Abbot that Luella was in the kitchen, and Mrs. Sam Abbot she went out there, and I went, too, and I never heard anythin' like the way she talked to Luella Miller. I felt pretty hard to Luella myself, but this was more than I ever would have dared to say. Luella she was too scared to go into hysterics. She jest flopped. She seemed to jest shrink away to nothin' in that kitchen chair, with Mrs. Sam Abbot standin' over her and talkin' and tellin' her the truth. I guess the truth was most too much for her and no mistake, because Luella presently actually did faint away, and there wa'n't any sham about it, the way I always suspected there was about them hysterics. She fainted dead away and we had to lay her flat on the floor, and the Doctor he came runnin' out and he said somethin' about a weak heart dreadful fierce to Mrs. Sam Abbot, but she wa'n't a mite scared. She faced him jest as white as even Luella was layin' there lookin' like death and the Doctor feelin' of her pulse. "But the Doctor he didn't pay much attention. He was bendin' over Luella layin' there with her yellow hair all streamin' and her pretty pink-and-white face all pale, and her blue eyes like stars gone out, and he was holdin' onto her hand and smoothin' her forehead, and tellin' me to get the brandy in Aunt Abby's room, and I was sure as I wanted to be that Luella had got somebody else to hang onto, now Aunt Abby was gone, and I thought of poor Erastus Miller, and I sort of pitied the poor young Doctor, led away by a pretty face, and I made up my mind I'd see what I could do. "I waited till Aunt Abby had been dead and buried about a month, and the Doctor was goin' to see Luella steady and folks were beginnin' to talk; then one evenin', when I knew the Doctor had been called out of town and wouldn't be round, I went over to Luella's. I found her all dressed up in a blue muslin with white polka dots on it, and her hair curled jest as pretty, and there wa'n't a young girl in the place could compare with her. There was somethin' about Luella Miller seemed to draw the heart right out of you, but she didn't draw it out of ME. She was settin' rocking in the chair by her sittin'-room window, and Maria Brown had gone home. Maria Brown had been in to help her, or rather to do the work, for Luella wa'n't helped when she didn't do anythin'. Maria Brown was real capable and she didn't have any ties; she wa'n't married, and lived alone, so she'd offered. I couldn't see why she should do the work any more than Luella; she wa'n't any too strong; but she seemed to think she could and Luella seemed to think so, too, so she went over and did all the work—washed, and ironed, and baked, while Luella sat and rocked. Maria didn't live long afterward. She began to fade away just the same fashion the others had. Well, she was warned, but she acted real mad when folks said anythin': said Luella was a poor, abused woman, too delicate to help herself, and they'd ought to be ashamed, and if she died helpin' them that couldn't help themselves she would—and she did. "'I s'pose Maria has gone home,' says I to Luella, when I had gone in and sat down opposite her. "'Yes, Maria went half an hour ago, after she had got supper and washed the dishes,' says Luella, in her pretty way. "'I suppose she has got a lot of work to do in her own house to-night,' says I, kind of bitter, but that was all thrown away on Luella Miller. It seemed to her right that other folks that wa'n't any better able than she was herself should wait on her, and she couldn't get it through her head that anybody should think it WA'N'T right. "'Why don't she stay home and do her washin' instead of comin' over here and doin' YOUR work, when you are just as well able, and enough sight more so, than she is to do it?' says I. "Luella she jest set and stared at me for all the world like a doll-baby that was so abused that it was comin' to life. "She stared at me and she was pretty pale. "Then a red colour came flamin' all over her face. 'I ain't goin' to kill him, either,' says she, and she begun to cry. "'Yes, you BE!' says I. Then I spoke as I had never spoke before. You see, I felt it on account of Erastus. I told her that she hadn't any business to think of another man after she'd been married to one that had died for her: that she was a dreadful woman; and she was, that's true enough, but sometimes I have wondered lately if she knew it—if she wa'n't like a baby with scissors in its hand cuttin' everybody without knowin' what it was doin'. "Luella she kept gettin' paler and paler, and she never took her eyes off my face. There was somethin' awful about the way she looked at me and never spoke one word. After awhile I quit talkin' and I went home. I watched that night, but her lamp went out before nine o'clock, and when Doctor Malcom came drivin' past and sort of slowed up he see there wa'n't any light and he drove along. I saw her sort of shy out of meetin' the next Sunday, too, so he shouldn't go home with her, and I begun to think mebbe she did have some conscience after all. It was only a week after that that Maria Brown died—sort of sudden at the last, though everybody had seen it was comin'. Well, then there was a good deal of feelin' and pretty dark whispers. Folks said the days of witchcraft had come again, and they were pretty shy of Luella. She acted sort of offish to the Doctor and he didn't go there, and there wa'n't anybody to do anythin' for her. I don't know how she DID get along. I wouldn't go in there and offer to help her—not because I was afraid of dyin' like the rest, but I thought she was just as well able to do her own work as I was to do it for her, and I thought it was about time that she did it and stopped killin' other folks. But it wa'n't very long before folks began to say that Luella herself was goin' into a decline jest the way her husband, and Lily, and Aunt Abby and the others had, and I saw myself that she looked pretty bad. I used to see her goin' past from the store with a bundle as if she could hardly crawl, but I remembered how Erastus used to wait and 'tend when he couldn't hardly put one foot before the other, and I didn't go out to help her. "But at last one afternoon I saw the Doctor come drivin' up like mad with his medicine chest, and Mrs. Babbit came in after supper and said that Luella was real sick. "I didn't say anythin', but I considered how she had been Erastus's wife and how he had set his eyes by her, and I made up my mind to go in the next mornin', unless she was better, and see what I could do; but the next mornin' I see her at the window, and pretty soon she came steppin' out as spry as you please, and a little while afterward Mrs. Babbit came in and told me that the Doctor had got a girl from out of town, a Sarah Jones, to come there, and she said she was pretty sure that the Doctor was goin' to marry Luella. "I saw him kiss her in the door that night myself, and I knew it was true. The woman came that afternoon, and the way she flew around was a caution. I don't believe Luella had swept since Maria died. She swept and dusted, and washed and ironed; wet clothes and dusters and carpets were flyin' over there all day, and every time Luella set her foot out when the Doctor wa'n't there there was that Sarah Jones helpin' of her up and down the steps, as if she hadn't learned to walk. "Well, everybody knew that Luella and the Doctor were goin' to be married, but it wa'n't long before they began to talk about his lookin' so poorly, jest as they had about the others; and they talked about Sarah Jones, too. "Well, the Doctor did die, and he wanted to be married first, so as to leave what little he had to Luella, but he died before the minister could get there, and Sarah Jones died a week afterward. "Well, that wound up everything for Luella Miller. Not another soul in the whole town would lift a finger for her. There got to be a sort of panic. Then she began to droop in good earnest. She used to have to go to the store herself, for Mrs. Babbit was afraid to let Tommy go for her, and I've seen her goin' past and stoppin' every two or three steps to rest. Well, I stood it as long as I could, but one day I see her comin' with her arms full and stoppin' to lean against the Babbit fence, and I run out and took her bundles and carried them to her house. Then I went home and never spoke one word to her though she called after me dreadful kind of pitiful. Well, that night I was taken sick with a chill, and I was sick as I wanted to be for two weeks. Mrs. Babbit had seen me run out to help Luella and she came in and told me I was goin' to die on account of it. I didn't know whether I was or not, but I considered I had done right by Erastus's wife. "That last two weeks Luella she had a dreadful hard time, I guess. She was pretty sick, and as near as I could make out nobody dared go near her. I don't know as she was really needin' anythin' very much, for there was enough to eat in her house and it was warm weather, and she made out to cook a little flour gruel every day, I know, but I guess she had a hard time, she that had been so petted and done for all her life. "When I got so I could go out, I went over there one morning. Mrs. Babbit had just come in to say she hadn't seen any smoke and she didn't know but it was somebody's duty to go in, but she couldn't help thinkin' of her children, and I got right up, though I hadn't been out of the house for two weeks, and I went in there, and Luella she was layin' on the bed, and she was dyin'. "She lasted all that day and into the night. But I sat there after the new doctor had gone away. Nobody else dared to go there. It was about midnight that I left her for a minute to run home and get some medicine I had been takin', for I begun to feel rather bad. "It was a full moon that night, and just as I started out of my door to cross the street back to Luella's, I stopped short, for I saw something." "I saw what I saw, and I know I saw it, and I will swear on my death bed that I saw it. I saw Luella Miller and Erastus Miller, and Lily, and Aunt Abby, and Maria, and the Doctor, and Sarah, all goin' out of her door, and all but Luella shone white in the moonlight, and they were all helpin' her along till she seemed to fairly fly in the midst of them. Then it all disappeared. I stood a minute with my heart poundin', then I went over there. I thought of goin' for Mrs. Babbit, but I thought she'd be afraid. So I went alone, though I knew what had happened. Luella was layin' real peaceful, dead on her bed." This was the story that the old woman, Lydia Anderson, told, but the sequel was told by the people who survived her, and this is the tale which has become folklore in the village. Lydia Anderson died when she was eighty-seven. She had continued wonderfully hale and hearty for one of her years until about two weeks before her death. One bright moonlight evening she was sitting beside a window in her parlour when she made a sudden exclamation, and was out of the house and across the street before the neighbour who was taking care of her could stop her. 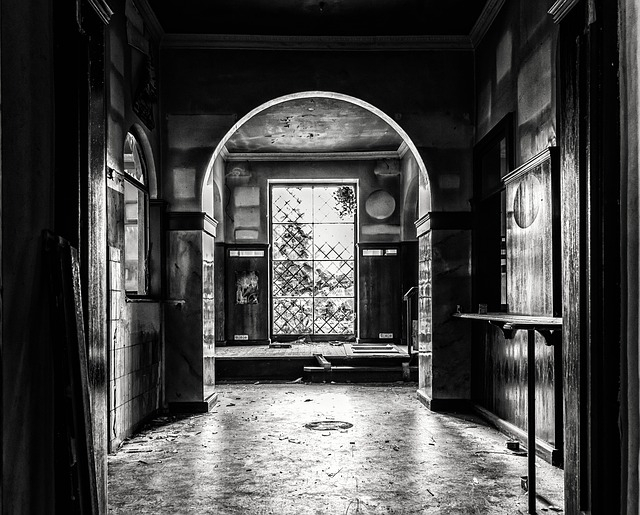 She followed as fast as possible and found Lydia Anderson stretched on the ground before the door of Luella Miller's deserted house, and she was quite dead. The next night there was a red gleam of fire athwart the moonlight and the old house of Luella Miller was burned to the ground. Nothing is now left of it except a few old cellar stones and a lilac bush, and in summer a helpless trail of morning glories among the weeds, which might be considered emblematic of Luella herself. Add Luella Miller to your own personal library.